HalloweenCostumes.com is committed to providing a world class shopping experience to our customers around the globe. From time to time, we hear from our customers about their experiences. Browse our customer feedback below or email us your own feedback. We'd love to hear from you! "Okay, when my son and his friend decided to go to prom in tuxes of bright orange and powder blue, I knew it was going to be a challenge. After searching locally, all hope seemed to be lost. We found your website in a totally random search, and though we were reluctant to rent a tux from a website, we knew it was our only hope to get them what they wanted; it really paid off. Ordering from you was easy; you made it easy to order the proper sizes, and your shipment was delivered FAST! When I had a concern about the return date, I called and spoke with a professional, real-live representative that gave me flexibility. When we received the suits, they were clean and spotless. The folds steamed out easily with nothing but an iron's steam, held just in front of the garments as they hung, without touching them at all. Everything went perfectly, and at the end my biggest concern was how much it would cost me to ship the suits back to you. So far everything went so well I thought that it was all too good to be true. EVERYONE should know that it just does not cost much for the service and product received! I paid a little extra to make sure the suits were delivered, with a confirmation of delivery since we are in Kansas. I got it and then I was done...or so I thought. Two weeks later I received a hand-written envelope in the mail, and on the back, underlined and written, "Orange Tuxedo Pants." When I saw it I thought, "Of course, we messed something up and now we must pay extra." But as well as everything had gone, I was not really concerned, I planned to just take care of it. But, there I stood in my driveway opening the envelope and inside was nothing but a blank sheet of white paper, folded around a ten dollar bill. Your team came across money that clearly my son had forgotten about, and that I never even thought to check pockets for, and you actually sent it back to us. I was stunned, and don't even know how to give you a proper thank you. I will let all my friends know, Facebook and otherwise, what a great, honorable, honest, and professional company that you are." "The kids loved the costumes, thank you so much." 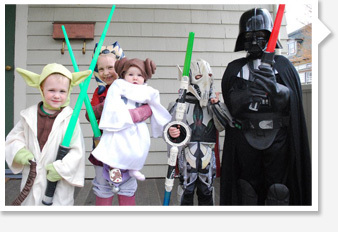 Shawn 8yrs – "Everyone freaked out when they saw me as Darth Vader...especially my friends. The mask is cool because it has air holes to breathe and eye sockets that look just like Darth. I can see out, but people can't see it. I like that." Leshee 6yrs – "When I wear it, it is like I have a protective force-field around me." Tom 4yrs – "My double-end lightsaber...I like it a lot. I like my lightsaber because it has a hook that keeps it from collapsing so I can keep it out." Mich 3 yrs – "My costume is really really cool. They were like costumes we never had before. It's fun to be in my costume." "I ordered an authentic Gene Simmons costume from this company. The package arrived earlier than I expected. The costume came in its own carrying case, with extra pieces in case some of the metal clips came off from wear. The boots came in an amazing flame box. Great experience. I will be purchasing from them again." "I just wanted to say, 'thank you.' I received my order today and was pleasantly surprised to receive it soooo quickly. Was not expecting the order to arrive for a few more days. We opened it and it's perfect!! My daughter is doing a book report on Indians, and she needed the costume to act out her book report. Thank you again." "This website offers a large selection of Halloween costumes made from quality materials. The site is easy to navigate and their prices are great. Halloweencostumes.com has different shipping options, even for international. I would recommend shopping for costumes on this site." "Just wanted to say a huge thank you to you all at Halloween Costumes. I ordered my costume on Friday 15 April... and have it in my hands today 20 April in Australia! The costume is awesome and the quality very good. I thought with the Easter break it may not get here in time, but delivery was amazing. Thank you again...will definitely save your web page to 'favourites'." [after being emailed a copy of her order per her request] "Perfect! I see why you guys are rated A+ from the BBB! thanks so much!" "The customer service level I received was outstanding. I had a question regarding what size to order for my 5 year old son. The question initially couldn't be answered by the live chat customer service representative. The representative was named Tyler, he went to the warehouse and measured both costumes. Because of his willingness to do this I ordered the correct size. Had he not done that I would have ordered the wrong size and would have had to do a return. Also this provided me with a comfort level and I subsequently ordered costumes for the whole family, rather than purchase those other costumes through a retail establishment." I wanted to thank you for the great customer service and terrific costume! The online chat is so helpful and the staff is courteous and knowledgeable. what a pleasure to deal with. I have already referred 3 people to the site, and I believe two have already placed orders.Thanks again. I look forward to doing business with you again next year." "I just wanted to thank you for how fast the shipping was on my costume. Your description of the item was accurate and my costume fits great! Thanks for such great customer service. I will be ordering from your company in the future and recommending it to others for sure!" I just wanted to let you know that I am exceptionally impressed with your customer service. I placed an order that arrived quickly and securely. One item was missing and was shipped almost as soon as I sent an email request for the item. I phoned in since your email reply went to my spam folder and received exceptional phone support. Thank you for all you do." "I just want to say that you have made a young man a very very happy young man !!!!!!!!! Thank you very much for your patience and co-operation with ordering his orange tux and accessories. It fits awesome...with just a slight hemming of the pants...will email a pic closer to grad in June...thank you again and its been a real pleasure to do business with you and I will highly recommend your company to family, friends and colleagues!!!!" I recently purchased a Green Lantern lantern and got it a LOT faster than I thought. I just wanted to say thanks for the great service and that I will be sending all my geeky friends your way. When the box was sitting on the steps I looked ay my friends and said, "There's no way that it's here already". They were green with envy over my Green Lantern lantern!" "Products are quality and affordable. The website has successfully offered what I have needed. It is clear and easy to use and most importantly I got my product on time and like I said before I was very pleased that affordable did not mean very low quality. I really appreciate my experience and I hope this business prospers because of its good and honest services! Thanks to all the staff that make it possible." I was absolutely impressed with my experience - the costume was great- however my cousins costume was too big on her and so I let her wear mine and I wore hers-it was not as fun as the one I ordered from you but she felt better in it as she did not have to use a whole bunch of safety pins. The party was a huge success Grandma was able to bring in her 80th in a big way. I do not have the pictures yet but will probably have then soon. Thank you for all of your help in getting me (well my cousin :) ) a costume on time." "I ordered my "outfit" for a benifit weekend (4/27-28-29)with the Shrine ladies(wives of Shriners). The theme is the Roaring 1920's. I was able to get all that I needed for my outfit and it looks great. I was worried that it would have that CHEAP look. But everything looks great and a lot of the other ladies have ordered from you after seeing my "stuff". I will surely order from you again when I needed something special. My order was very prompt and was well packaged. VERY pleased with everything."